An essay of mine has been published in The Tangerine Magazine. Short extract below. I met Laura in a club. We kissed in a basement pounding to the bitter-sweet chorus of ‘Sorry’ by Justin Bieber. When the lights came on and we got kicked out I typed my address into her phone and hopped into an Uber while she went to find her bike. We’d agreed I would leave my front door on the latch. I should have predicted that she wouldn’t show up; she’d sober up and decide to go home, she’d realise she was too drunk to come to my house. Her phone died on the way to where I lived, but she met an acquaintance in the street and asked the way: with the occasional lucidity of the very drunk she remembered the postcode exactly. She walked through my front door and up the stairs and got into bed beside me. I went to the Hague recently to begin a collaboration with the artist Danielle Lopes Cardozo in response to her recent exhibition. 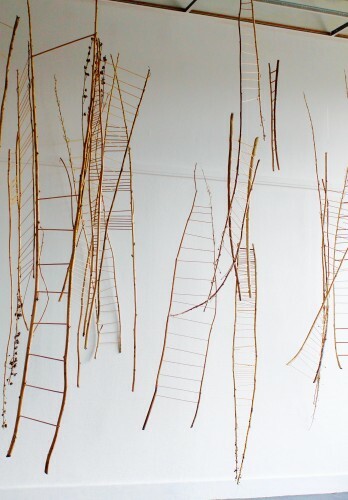 The Ladder Project is an installation composed of thirty one ladders hanging from the ceiling of Gallery Sophie. I produced a written response composed of 31 paragraphs, one for each ladder. A few are below. 2) Two bridges at either end of the street, the dark-watered canal that along the length of the doorsteps. The door is still dark green, same colour as the water. I looked through the glass, there was the long brick hall, the metal gate at the end. Beyond it, the unreachable landscape of my memory. I took a photo for Instagram and left. 14) Think of the ladders as guardian angels, as acts of love. Think of the ladders as a succession of gifts. Think of the ladders as your wife, as your husband, as your child. Think of the ladders as a sentence which, for better or for worse, you can’t redact. 20) Emotional stress and events of personal significance push us strongly toward magical meaning-making, says Matthew Hutson in Psychology Today. We look for patterns because we hate surprises and because we love being in control. Elsewhere, Magical Thinking is described as an Insidious Thought Error. But Matthew Huston says Anything Can Be Sacred. 21) Danielle met my mother at a local nursery, we had just moved to Den Haag from London, and I was two. I saw her getting you into a jacket, said Danielle. I knew from how she was putting you into the jacket that we would be friends.